It’s been a long time since I first (and last) watched Cannonball Run – 30 years actually… Boy does that make me feel old. 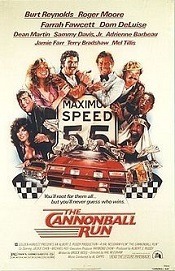 Cannonball Run hit theatres back in 1981 and despite being super cheezy, manages to be a really funny movie. The movie takes it’s name from the Cannonball Run, a cross country (U.S.A.), big money race that draws cars from all over. Along the long race the teams actively attempt to sabotage each other.Staring Burt Reynolds and Dom DeLuise co-star as racer J.J. McClure and his buddy, mechanic Victor Prinzi who pose as paramedics and drive an Ambulance. Roger Moore plays Seymour Goldfarb, Jr. who poses as no one other than… Roger Moore /James Bond. Rat Packers Dean Martin and Sammy Davis, Jr. play aging former race car driver Jamie Blake and scam artist Morris Fenderbaum who disguise themselves as priests and drive a red Ferrari. Adrienne Barbeau and Tara Buckman play as Marcie Thatcher and Jill Rivers – the “hot chicks” that use their womanly charms to wriggle out of legal troubles along the way. Jamie Farr (you know: Klinger from M.A.S.H.) appears as Sheik Abdul ben Falafel Jackie Chan goes mostly uncredited as “Mitsubishi Driver #1.” So, yeah, it’s a pretty eclectic and silly cast and it still fun to watch. It’s not a movie to watch if you want depth – this is a silly race movie with a silly cast and silly situations. This entry was posted on December 10, 2012 by catfishman. It was filed under Uncategorized and was tagged with 1981, Adrienne Barbeau, block buster, Burt Reynolds, Cannonball, comedy, Dean Martin, Dom DeLuise, dumb, film, funny, Jamie Farr, movie, race, Sammy Favis Junior, silly.